Introduction: GoDaddy is worlds largest domain registrar, as they say. Thanks to their large advertisements and business model. Which have created a lot of buzz among people, even a kid from 10th grade would have heard about Godaddy at least once. GoDaddy started as a domain registrar and eventually started making themselves as one stop shop. And domain is the primary element which is important to get started with an online presence. So, everyone needs to buy a domain name first before they can link it to a server (Web Hosting). Now, as people purchased the domain from Godaddy they usually end up buying hosting at the same business. The problem here is not Godaddy itself, but the way people think when purchasing something and lack of awareness too. Of course, no one educates a consumer, and every single blogger out there starts just promoting hosting companies and domain registrars as if they have personally used it. Now, this is where the biggest problem crops up. As you see recommendations and suggestions everywhere, you will simply think that you should go with Godaddy. No offense here, even if it is not Godaddy then Bluehost or some XYZ company. The main reason for writing this blog is to introduce you to the hosting industry and reveal some useful, interesting facts you should know as a consumer. So let us get back to Godaddy. As a domain registrar, we are sure they knocked out the business, and no one can beat them soon. Again, the reason is the lack of awareness among customers. Godaddy does not have much technical expertise in hosting or servers industry. We are a design and development agency as well, and we worked with thousands of clients and on their projects. We know, better than those bloggers who only write well-written sales copy to convince you to make you purchase Godaddy or some XYZ hosting company plans. In this article, we will use USD as currency and US Linux Web Hosting plans for ease of comparison. However, we are sure no matter which currency or which country you choose. The transparency part is still not fulfilled by Godaddy. Let's start with pricing. As this is the key factor that convinces you as a customer to decide on the purchase. 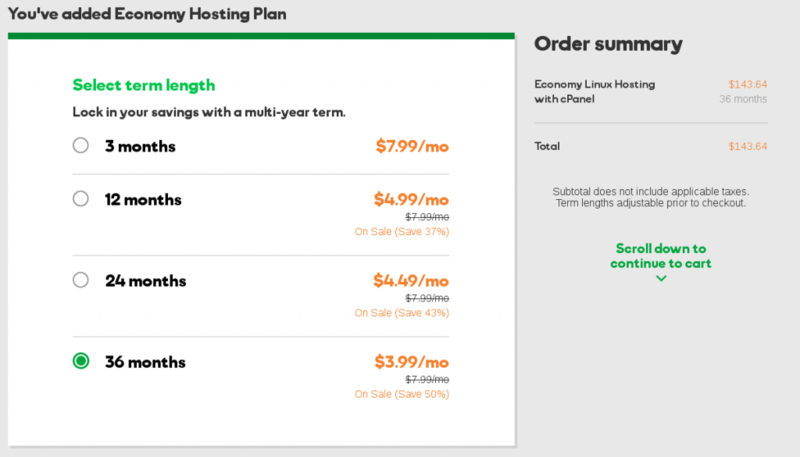 In web hosting industry three kinds of pricing models exist. c) Charge reasonable prices but offer freebies during signup and charge back during renewal the full prices. From the three models, GoDaddy uses all methods. Their primary focus is on model a) and model b). Not only Godaddy, this business model is followed by more than 90% web hosting companies out there. I am aware, you still did not get what I am talking here. Let me Explain. Set aside the features for a while, let's discuss pricing first. And let us show you how they charge you at signup and after sale period is completed. Economy Plan at $7.99 / month, Deluxe Plan at $10.99 / month and Ultimate Plan at $16.99 / month. Now here is a trick in pricing, by using .99 as pricing, you will see that $ 3.99, $ 4.99 and $ 7.99 at purchase and renewal. Now if you think logically, .99 is just 0.1 less than 1. So the actual pricing at renewal will be as like this. Economy plan at $8, Deluxe plan at $11 and Ultimate plan at $17 per month. Now, think how they are marketing by using 0.99 and tricking you. This is one among the many things about their pricing tricks. Next, at signup on the homepage, you will see above screenshot pricing. Wait, this pricing will apply if you purchase the plans for 3 years. You can see that the pricing will be applied, only when you purchase their web hosting for 36 months, that is 3 yrs. Now, without knowing anything about their servers or support you will simply have to buy for 3yrs without even knowing about the future outlook. Who knows, your hobby blog will never be maintained by you after 4 months or 1 yr. So, you are wasting your investment just because you have seen a low price and getting yourself locked with them. Locking in the sense, your money will not be returned back. So this is the drawback of the low pricing. Again, let me tell you, this applies to all the plans. Here is proof for your sake, as you will not believe easily. Now the funny part here with Godaddy is, that they are indirectly telling you that "Look we are locking you with this sale price by making you purchase for multiple years". But, as I said, unfortunately, consumers are not smart enough to even identify this line "Lock in your savings with a multi-year term". Some of you might argue, why should I bother, they are offering discount and I will get it when I purchase it for a long term and I do not need to renew every now and then. Yes, you are right, you are thinking like a normal consumer. The catch is by buying a product or service that you do not know if you actually use for 3 years or not, you are wasting your money at first place. Second thing is you are purchasing something that you do not know how it works, as there is no free trial or try before you buy model. You have blindly trust and invested your money on a product without even know what is in for you. Third thing, you are eligible for sale price only once and not everytime you renew and this is the biggest thing you should understand now. Let me do some math here and give you exact figures. Again, I am not adding any taxes or addons or mainly needed stuff. 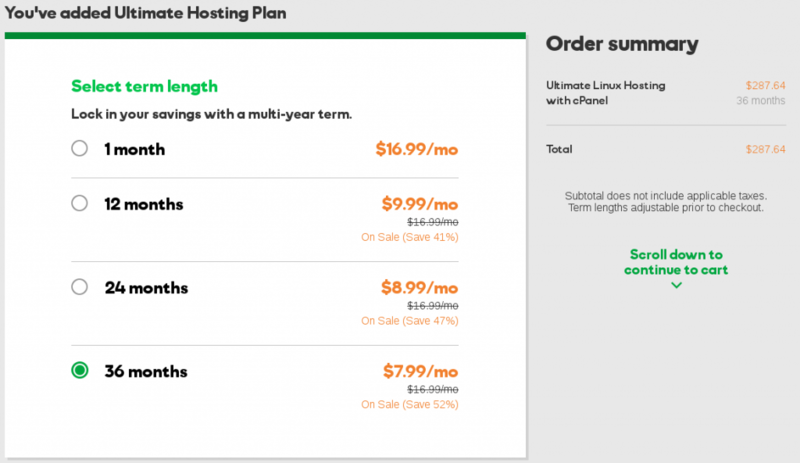 Just the hosting pricing if you do a renewal. Let me tell you, this is renewal price as seen today. 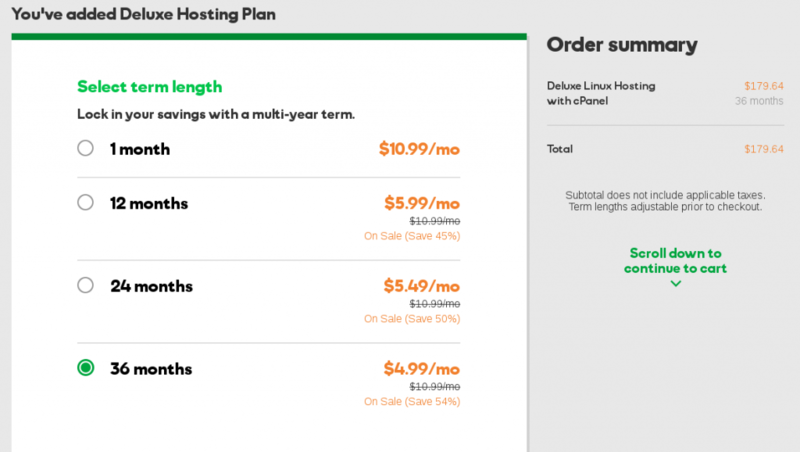 And as per GoDaddy terms, plan pricing may vary and plans can be changed as time passes. That means, if you purchase 3 yrs hosting and the pricing increase by the end of your term, then new prices will apply. It means, by locking yourself to single provider for long time, you will not only loose the ability to move to other company ( if you are not happy with product ) but also you are liable to do renewal at the market price at your renewal date. So, there is no protection on pricing. What you see today may not remain same for another year. For example, check the prices on Feb 26th, 2016. So, today if you buy a plan at the sale price, after 3 years there is no guarantee that you will renew at the same price, you saw today during your research or checkout. Let me remind you again, the discussion is only on hosting pricing. I have not discussed on SSL and Backups pricing. We have made a video on this, to explain you without reading all this article. But, not everyone can watch video nor everyone can understand just with a video explanation. So we made this article. Let us explain the two terms, in this article now. The first thing we need to learn before we discuss Unlimited web hosting and Unmetered or Unlimited Bandwidth is, how servers work and what does it mostly build. Servers are many types, but here we are discussing webserver. A web server is essentially a computer with massive resources and internet bandwidth. Mostly divided into multiple partitions virtually using software to lease as web hosting plans for the end user or customer. Now you are aware that all the physical parts come with some limitation, for example, servers have HDD or SSD storage similar to your computer or laptop. But, the hardware is more robust and holds with more capacity. For a desktop computer, we rarely find someone using 5 TB hard disk drive. In the case of servers, it's okay to see everything in significant figures. So it does not mean there is an unlimited hard disk drive. If there is an unlimited hard disk drive with say 10000 TB disk space, do you think the head moves from one sector to another sector in a jiffy? No. So there is no such thing as Unlimited storage space. Everything is limited, including the Bus speed, network device speed, etc., Unlimited storage is a term used by companies to sell the stuff because people are seeing it everywhere. When you buy unlimited storage, you do not know, or aware when you crossed their FUP or AUP. It means you are at risk of suspension or liable to upgrade to VPS or dedicated hosting. Unlimited Bandwidth: Again this is same as your internet or broadband you use for your home computer. The major difference is servers connected via tier1, tier 2 or tier 3 ISPs. Where as home and office users are using tier 4 providers. Servers are connected to TBps or Gbps speeds and home computers and workstations with Gbps and Mbps and sometimes Kbps. The major difference is the way they are linked to internet and latency. All datacenters connected in Gbps or TBPs (rarely) internet backbones. Now again, just like hard disk, bandwidth is limited too. Unless your web hosting has the own network. Everything set to certain limits. Just the way storage with extensive tagline is dangerous, bandwidth with unmetered or unlimited is wrong too. If you do not know, the maximum AUP or FUP and you cross their system limits. You will face account suspension and websites will go down, until you renew your bandwidth. So it's always better to know or opt for limited resources. Limited resources will keep you updated about your usage. Another important thing to consider here is, by purchasing oversold plans, you are in a situation, where the reliability and security become less. As everyone opts for unlimited hosting, it becomes difficult for the hosting company to manage the users and hence it will lead to lots of issues, which includes websites getting hacked (common with godaddy hosting). We hope, you like this review. Are you looking for web hosting plans to host your website? Try us today. We offer better hosting than more than 200 companies including Godaddy on the internet. check our web hosting plans for India and Linux Web Hosting Plans for everyone else. Thank you.